We’ve long heard tell of the vision of the paperless office, but what of the paperless football locker room? The Baltimore Ravens will be putting that approach to the test this Sunday with iPads in use rather than the thick paper playbooks traditionally used. Apple’s tablet has also been put to use over the playoffs to help players review gameplay footage, searching for the opponent’s telltale sign of running a blitz or correcting their own faulty techniques. 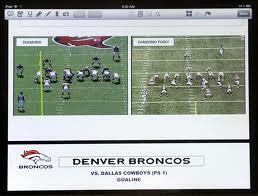 Yes, the key to winning Super Bowl XLVII may lie in a coach’s savviness in harnessing mobile technology. The app development team that may soon be able to claim a role in winning the Super Bowl are Baltimore-based Global Apptitude. Its GamePlan app offers the ability to digitize play schematics and add annotations. A backend syncing solution means a coach can sketch out how he wants a play to go down, and the players can see the same plans appear on their personal tablets. There’s also a custom video player that transcodes video being edited from live gameplay footage on the fly. Despite being based in Silicon Valley, it’s not clear if the San Francisco 49ers are employing any mobile technology in the locker room this Sunday – Apple or otherwise.